Pneumothorax and pneumomediastinum are among the most rarely reported complications after craniotomy because the surgical area is too far away from thoracic cavity to cause pneumothorax, which always results from iatrogenic injury.,,, Perioperative bilateral pneumothorax and pneumomediastinum could be fatal without early and proper treatment. To the best of our knowledge, it is the first case report to present the diagnosis and treatment of these complications which occur just after intracranial aneurysm clipping. A 64-year-old male who complained of headache for 1 day underwent an emergency intracranial aneurysm clipping after subarachnoid hemorrhage from rupture of posterior communicating artery aneurysm. His body weight was 60 kg and height was 169 cm. He was previously healthy, but a smoker (10 cigarettes a day for 40 years) without drug abuse and remarkable family history. Physical examination revealed axillary temperature of 37°C, blood pressure 140/90 mmHg, heart rate 106 bpm, respiratory rate 20 bpm, and oxygen saturation 95% on room air. He was drowsy without nausea or vomiting. Glasgow coma scale score was 15. Blood routine showed that white blood cell count was 15.63 × 109/L. Thoracic computerized tomography which was taken a day before the surgery revealed bullae and low attenuation area in bilateral lower lobes [Figure 1]. Written consent of publishing of this paper was obtained from the patient when he was discharged. The patient was positioned supine in the operating room. Anesthesia was managed with etomidate, fentanyl, propofol, remifentanil, and cisatracurium. After successful intubation on one attempt, chest auscultation revealed bilateral equal breath sounds without rales or wheezing. Vital volume was set at 450 mL and respiratory rate 12 bpm without positive end-expiratory pressure. The central vein was not punctured or catheterized. During surgery, the artery aneurysm was clipped with Sugita Titanium Aneurysm Clip (17-001-86, MIZUHO Corporation, Tokyo, Japan). The surgery lasted for 3 h and finished uneventfully without awakening the patient during the surgery. There was no blood transfusion. A total of 1000 mL lactated Ringer's solution was given. Urine output was 300 mL. The spontaneous breath was back 10 min after the surgery, so mechanical ventilation was stopped. Twenty min later, the patient developed a sudden dry cough without consciousness or extubation. Soon after the cough, oxygen saturation began to decline, so assisted ventilation was intermittently used to keep oxygen saturation more than 90%. In the meantime, subcutaneous emphysema was noted over his neck and chest. His blood pressure was 150/90 mmHg and heart rate was 70 bpm. A bolus of 50 mg propofol was given intravenously. Diminished breath sounds were detected in the left lung on auscultation. The patient's blood pressure and heart rate began to decrease. A thoracic surgeon was invited for consultation immediately and arrived 10 min later. After physical examination, needle aspiration was performed under local anesthesia in the left midaxillary line and in the fifth intercostal space, and then a large of tensioned air was immediately released, so tube thoracostomy was undergone at the same site. The procedures were followed by immediate improvement in oxygen saturation. During the whole period, heart rate was once decreased to 40 bpm, so a total of 1 mg atropine was administered intravenously and blood pressure was reduced to 70/40 mmHg, so 10 mg dopamine was given. No tear of the trachea or endotracheal tube obstruction was found under fiberoptic bronchoscopy. When his status was stable, the patient was taken to take cerebral and thoracic computerized tomography scan with oxygen supplementation. The thoracic computerized tomography demonstrated bilateral pneumothorax, pneumomediastinum, and subcutaneous emphysema in the neck and chest [Figure 2]. The patient was transferred to the intensive care unit. Two days later, the patient was sober and extubated. His oxygen saturation was around 95% with oxygen administration by a venturi mask. Oxygen saturation could be kept above 95% on room air on the next day. The intercostal tube was removed on postoperative day 12. 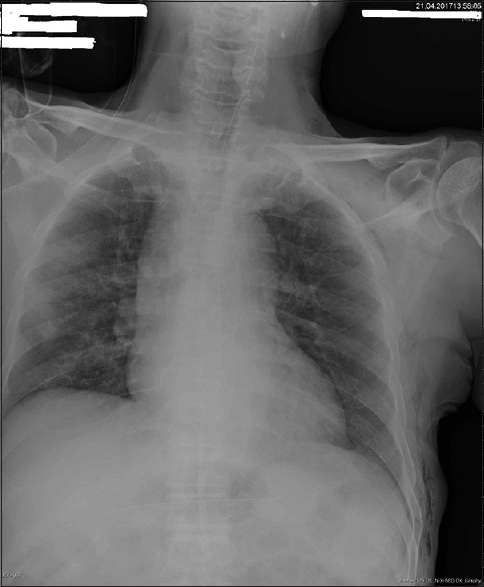 Follow-up chest radiograph on postoperative day 13 showed resolved pneumothorax and pneumomediastinum with residual subcutaneous emphysema in the neck and left chest wall [Figure 3]. The postoperative course was uneventful, and the patient was discharged with a little subcutaneous emphysema on postoperative day 17. In this case, this patient has a long history of cigarette use (10 cigarettes a day for 40 years). Preoperative chest computed tomography image reveals small bullae and low attenuation area. Therefore, he has two risk factors for pneumothorax and is predisposed to barotrauma and pneumothorax.,, Increased intraluminal and intra-alveolar pressure resulting from cough may make alveoli rupture, and then the air which is leaked outflows into the pleural cavity and along the perivascular sheath into the mediastinum. Tensioned air can break into the subcutaneous tissues of the neck and chest wall.,,, Therefore, pneumothorax, pneumomediastinum, and subcutaneous emphysema may be established. Subcutaneous emphysema of the neck and chest can be diagnosed by the clinical manifestation. 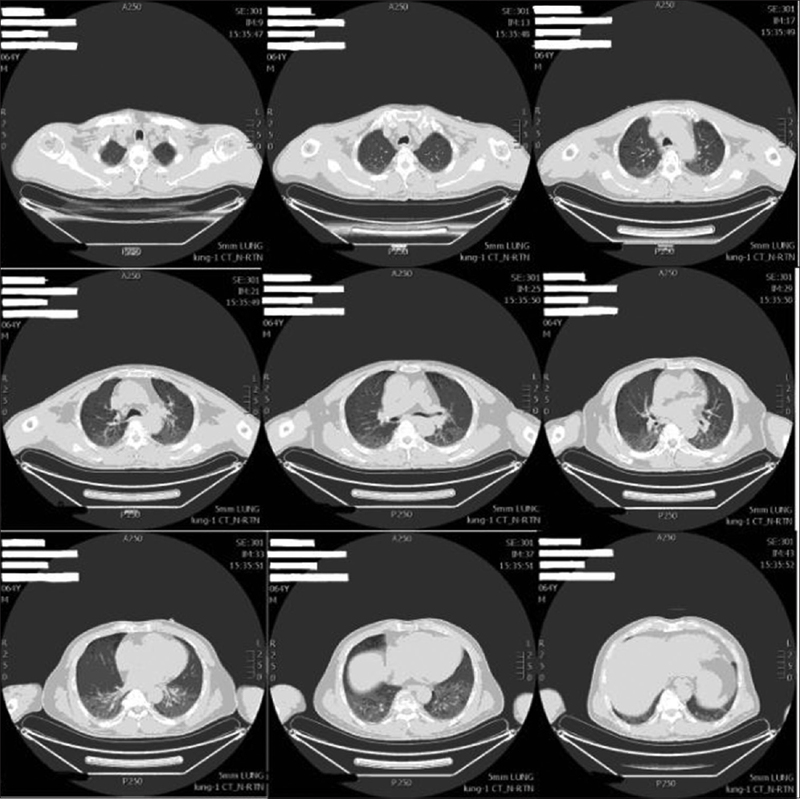 Chest X-ray or computerized tomography is a diagnostic for pneumothorax and pneumomediastinum., Conservative treatment can resolve pneumothorax and pneumomediastinum within 2 weeks in most patients. Our patient experiences decreased oxygen saturation and hemodynamical instability. The symptom indicates a tension pneumothorax with high pressure of air in his chest, thus justifying his need for a tube thoracostomy.,,,,, In our case, chest drainage was only performed in the left chest. Air volume in the right chest is relatively small, so it is left untreated with the expectation of spontaneous recovery. During anesthesia, pneumothorax can occur during any period. It is difficult to identify the symptoms for early diagnosis, because the patient under anesthesia cannot provide his complaints of substernal pain and dyspnea. If a patient who has predisposing factors and is under anesthesia presents high airway pressure, decreased oxygen saturation, progressive dyspnea, and diminished breath sound, the possibility of pneumothorax should be borne in mind. During anesthesia, nitrous oxide is not allowed, because it may expand the range of pneumomediastinum and pneumothorax and increase the risk of deterioration of the condition. This case may offer anesthesiologists a good opportunity to familiarize an uncommon disease. Awareness of early signs and management knowledge of pneumothorax and pneumomediastinum could lead to early recognition and intervention, which can improve the patient's outcome. Sucato DJ, Girgis M. Bilateral pneumothoraces, pneumomediastinum, pneumoperitoneum, pneumoretroperitoneum, and subcutaneous emphysema following intubation with a double-lumen endotracheal tube for thoracoscopic anterior spinal release and fusion in a patient with idiopathic scoliosis. J Spinal Disord Tech 2002;15:133-8. Sivalingam P, Tio R. Tension pneumothorax, pneumomediastinum, pneumoperitoneum, and subcutaneous emphysema in a 15-year-old Chinese girl after a double-lumen tube intubation and one-lung ventilation. J Cardiothorac Vasc Anesth 1999;13:312-5. Vera-Merchancano R, Hernández-Palazón J, Fuentes-García D, Fernández-Rodríguez LE. Intraoperative bilateral tension pneumothorax in a patient undergoing breast augmentation surgery with general anesthesia. J Plast Reconstr Aesthet Surg 2014;67:e165-6. Rali AS, Manyam H. Bilateral pneumothoraces following BiV ICD placement: A Case of buffalo chest syndrome. Am J Case Rep 2015;16:703-6. MacDuff A, Arnold A, Harvey J; BTS Pleural Disease Guideline Group. Management of spontaneous pneumothorax: British thoracic society pleural disease guideline 2010. Thorax 2010;65 Suppl 2:ii18-31. Karasaki T, Shintomi S, Nomura Y, Tanaka N, Saito H, Yoshida Y, et al. Outcomes of outpatient treatment for primary spontaneous pneumothorax using a small-bore portable thoracic drainage device. Thorac Cardiovasc Surg 2014;62:516-20. Garg R, Sanjay, Das V, Usman K, Rungta S, Prasad R, et al. 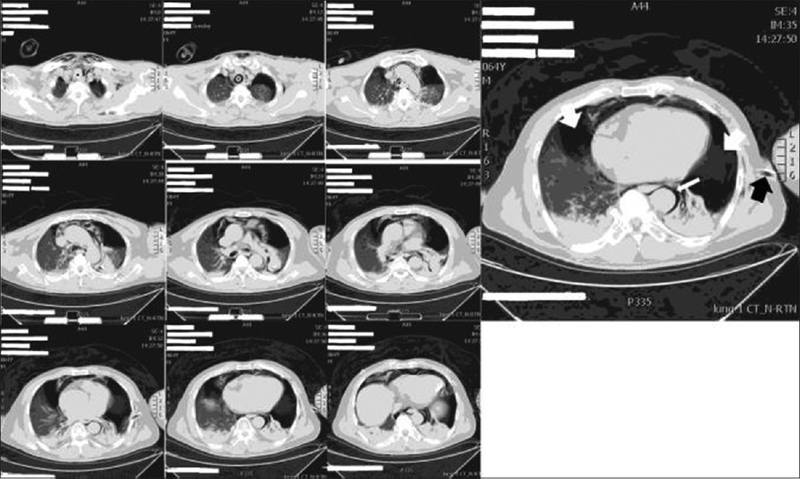 Spontaneous pneumothorax: An unusual complication of pregnancy – A case report and review of literature. Ann Thorac Med 2008;3:104-5. Schoenenberger RA, Haefeli WE, Weiss P, Ritz RF. Timing of invasive procedures in therapy for primary and secondary spontaneous pneumothorax. Arch Surg 1991;126:764-6. Chan SS. Tension pneumothorax managed without immediate needle decompression. J Emerg Med 2009;36:242-5. Konstantinou F, Potaris K, Syrigos KN, Tsipas P, Karagkiouzis G, Konstantinou M, et al. Anovel technique to treat air leak following lobectomy: Intrapleural infusion of plasma. Med Sci Monit 2016;22:1258-64.